Perfect for adding a splash of color or hiding storage, this Lux Hotel bedskirt offers a touch of style to your bedroom. With a simple design and a range of available colors, the bedskirt matches any decor with minimalist elegance. The bedskirt is machine washable for easy maintenance. 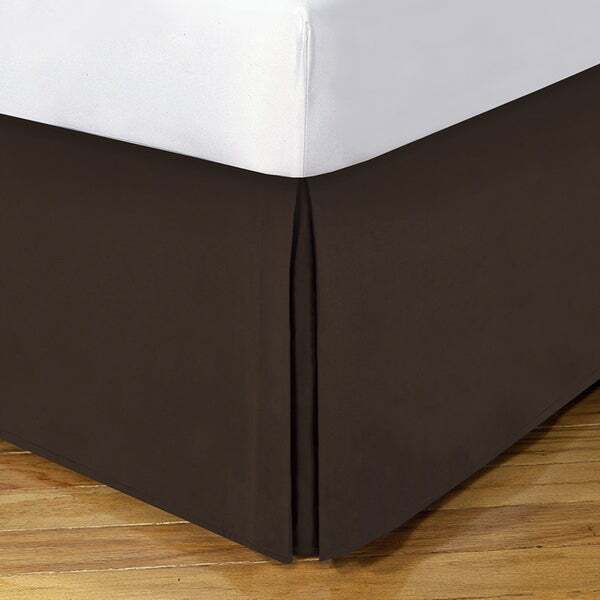 14-inch drop Bedskirt has a very good fit also good material . I would recommend this to my friends and Family . The dark brown color was spot on, but the white part that goes between mattresses was just thicker than tissue paper and came apart at the seam just unfolding it. If you need the color buy it, but handle with care. We are the people that buy a down comforter one size larger than our actual bed size, so that we can have plenty of extra slack for comfort...so that prevented us from purchasing the bed skirt that came with the Madison Park Dune 6-piece Beige Duvet Cover Set (which we LOVED) because it would have been too large. So I opted for this Lux Hotel 14-inch Drop Bedskirt which looked rich, chic and suede textured in the photo. It was quite the opposite except for its deep color. I was disappointed with the texture and material, its very thin, not soft and comes wrinkled. It looks okay. Not what I expected. I've had company 4 times and it's already ripped along the seam about 12 inches. I would not recommend. Just what I needed to accent my duvet cover. Vibrant turquoise color looks amazing bought 2 Twin XL for a split king adjustable frame. Works gr8!! flimsy,no slits at corners,can see through fabric!DO NOT PURCHASE! I thought this was a luxurious hotel bed skirt - but I guess you first must ask yourself what sorts of hotels you think are luxurious - if motel 6 is your idea of a fine hotel then this might be what you are looking for, but if Hyatt is more your idea of upscale then this product falls way short - I simply took it out of the package and then took it directly to my trash bin (returning to overstock is never fun). I'll chalk it up to a lesson learned, but I thought I would share with other shoppers - The $31.70 I paid was ridiculous - I would pay no more than $8.00 for the quality of product I received. Do yourself a favor and PASS on this product. The color, length and style was just what I was looking for in the bedskirt. The material was soft but yet durable. And the color was vibrant. I would definitely recommend this product to anyone looking for a nice, fitting bedskirt. The inside of this bedskirt is so flimsy it torn while putting on the bed; had to tape the torn parts. Then I noticed a white streak in the front also. We had new carpet put in and we have a sleep number bed, which is very time consuming to take apart and put back together. So too late to return. Very disappointed. I wish I had opted for a little higher end bed skirt. This one is a little light weight and actually tore a little while I put it on. It looks okay and I'm using it but I wish it would be a little heavier, which would make it hang better. not especially happy with the quality. Fits perfectly. The color is just as advertised. The color of this bedskirt was difficult to find. It worked out perfectly for my queen bed. Love this style of bed skirt. Looks beautiful with my new bedspread. Love the option of so many colors. Truly a beautiful chocolate brown color. All of our beds have this particular skirt. Fits my California King bed perfectly. Can’t say enough about Overstock!! This is a great bedskirt. I steamed it when I put it on the frame and it’s simple and tailored and not fussy, which is exactly what I wanted. "What is the dimensions for a Twin XL?" Approximately 39 inches x 80 inches with a 14-inch drop. "To use this on a split king adjustable bed frame, would you put this over the stabilizer bar at the bottom , or tuck it around it ? Just curious how to make it fit ! Thanks.."
Actually My wife and I own an adjustable split king size Sleep Number bed. I actually had to cut the white material that goes under box spring (since it's different). We only left 5inches then used bed skirt pins to keep it in place. Haven't had any problems yet. Hope it helps you. We are a guest ranch and are updating some of our bedding. I needed a bed skirt to match a comforter. This was the closest color I could find.